Dean and Professor, Dr Joginder Yadav is an experienced teacher and clinician. He is a 1st rank holder from Rajiv Gandhi University and his specialization is MPT Orthopedics. He has more than 13 years of experience in academic, research, consultancy, training and professional practice. Prior to joining SGT University he was associated with several premiere institutions in one or more capacities as Consultant, Reader and Assistant Professor. Extremely dedicated and sincere towards his work he has got various publications on his name in various national and international journals. With his immense knowledge he has also been guiding students pursuing Master’s degree in Physiotherapy. He is extremely sincere and dedicated towards his work and has a vast experience of having organized a number of conferences, workshops and seminars throughout his career. His present focus is on establishing Institute as brand especially on International Platform. Besides this he is keen to create best teaching practices and placement at the Institute. She is a graduate from DAV College, Yamunanagar and a Post Graduate from SBSPGI, Dehradoon. She has been associated with the institute right from its inception and has played a crucial role in academic and curricular growth of the institute. She has got over 11 years and six months of teaching and hospital experience at places like Guru Jhambeshwar University, Indraprastha University and Manav Rachna International University etc. She has been guiding students pursuing Master’s degree in Physiotherapy. She has got 25 publications till date in various national and International journals and has got a book published as well. She has been looking after curricular , extracurricular and co curricular activities of Faculty of Physiotherapy and has represented the University in various National level Conferences and is the recipient of many awards. Her present focus is on establishing Institute as brand and creating best teaching practices at Faculty of Physiotherapy. Presently working as an Assistant Professor, Faculty of Physiotherapy, SGT University, Gurugram. She has over 6.5 years of experience in Academics/Hospitals. She did her graduation from DAV College of Physiotherapy and Rehabilitation Yamunanagar and Post Graduation in Neurophysiotherapy from M.M.I.P.R,Mullana, Ambala.Dr Bharti has worked with reputed hospitals like VIMHANS, New delhi , R.G Orthopaedics and Multispeciality hospital, Ludhiana and J.P hospital in Yamunanagar. She is also guiding students pursuing Masters Degree in Physiotherapy. She has 5 publications in national and International Journals and 3 papers in process till date. She has been guiding students pursuing Master’s degree in Physiotherapy. She has got numerous publications in various national and International journals. Her strengths are hard work and faith in God. She is currently working as an Assistant Professor, MPT (Cardiopulmonary). She is Pursuing PhD in Physiotherapy from SGT University. She has experience of 6 years and 8 months in Academics and Clinicals. She did her post graduation in Cardiopulmonary from Faridabad Institute of Technology, and graduation from Guru Jambheshwar University of Science & Technology, Hisar. She Co-ordinates in conducting workshops and seminars in the department. She is guiding and Mentoring students of Bachelor and Masters of Physiotherapy in their Research work . She has 6 published articles in National and International journals and 2 papers in process till date. Looking forward for some more feathers in the cap and is striving hard for it. Currently working as an Assistant Professor in the Faculty of Physiotherapy at SGT University. Have experience of 4 years and 5 months in Academics and Clinicals . Have completed Masters Degree of Physiotherapy in Orthopaedisc from Mullana University and Bachelors in Physiotherapy from Kurukshetra University . Member of Admission Committee of SGT University . Co-ordinates in conducting workshops and seminars in the department. Guiding and Mentoring students of Bachelor and Masters of Physiotherapy in their Research work . Have 4 published articles in National and International journals and 2 papers in process till date. Have a book published on Effect of Mobilization and Resistance training on patients with OA (ISBN no- 978-3-659-90473-8) , Lambert publishing house. Looking forward for some more feathers in the cap and is striving hard for it. Dedicated PT with 9.5 years of acute care experience;a history of exemplary ratings on performance reviews; solid credentials that include PTA Licensure for New York (USA), BLS & Lifesaving services certifications and Master’s Degree in PT with specialization in Neurology. Presently pursuing Phd from Amity University and teaching as Assistant Professor at Faculty of Physiotherapy SGT University.. Background includes work with pediatric, adolescent, adult and geriatric patients. Well versed in a broad range of PT programs, treatments and modalities, restoring function and mitigating disability for diseased and injured patients. Excellent interpersonal & communication skills and proficiency in patient assessment, time management and therapy program design & execution. Enthusiastic team player deeply committed to delivering quality care and achieving superior patient outcomes as a member of multidisciplinary case management team. He is currently working as an Assistant professor in Faculty of Physiotherapy, SGT University. He has got 2 years of teaching and clinical experience. He is an alumnus of SGT University and completed his Masters of Physiotherapy in Orthopeadics in 2015.He has got 3 publications in his name. His areas of interest are Orthopedic rehabilitation, low back pain management. His strengths are hard work and dedication towards his profession. His research has been published in Photon Journal of Physiotherapy. Presently working as an Assistant Professor, Faculty of Physiotherapy, SGT University, Gurugram. She has worked as a Physiotherapist in AIIMS, New Delhi for 4.5 years. She has five months of experience in Academics . She did her graduation from Gaur Brahaman College of Physiotherapy and Rehabilitation Brahmanwas ,Rohtak and Post Graduation in Neurophysiotherapy from Manav Rachana International University, Faridabad. She is also guiding students pursuing Masters Degree in Physiotherapy. She has 2 research papers in process till date. My strengths are hard work and faith in God. Dr. Sajjan Pal Currently working as an Assistant Professor in the Faculty of Physiotherapy at SGT University. He has experience of 9 months in Academics and Clinicals. 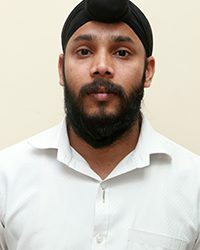 He has done his Masters Degree of Physiotherapy in Sports from Punjabi University, Patiala and Bachelors in Physiotherapy from GJU University, Hisar. He is also pursuing PhD in Physiotherapy from SGT University. His areas of interest are sports rehabilitation, on field sports evaluation and low back pain management. Dr. Sajjan Pal is also a Member of Admission Committee of SGT University and Co-ordinates in conducting workshops and seminars in the department. He is also looking after collaborations with different sports institutions and academies for students training Programme. He was also associated with Dalbir Football Academy at Patiala, Punjab as a chief physiotherapist for 1year. His strengths are hard work and dedication towards his profession.